RENO, NV SEPTEMBER 6, 2011 The Ultra4 Torchmate Stampede in Reno, NV this weekend has two Torchmate Racers JT Taylor and Jesse Haines on course. Torchmate CNC Cutting Systems is the Title Sponsor of the Ultra4 Stampede, after being a primary sponsor of the “Lucas Oil on the Edge” 2011 Griffin King of the Hammers TV Show and supporting an entire team for the Ultra4 series. Torchmate Racing teammates JT Taylor and Jesse Haines will put their cars to the test on the brutal track across the Nevada desert. JT Taylor, Torchmate Racings General Manager, will be driving the #13 Torchmate Racing TTB car and Jesse Haines, a Torchmate Fabricator, will be driving his rear steer #4499 car. Both drivers are already qualified for the 2012 Griffin King of the Hammers. 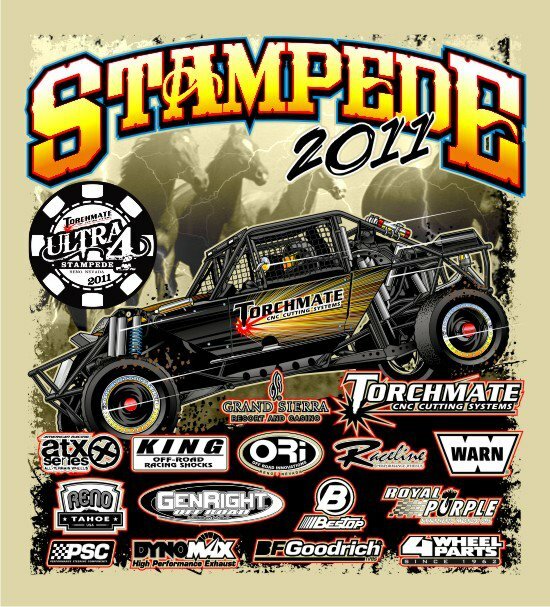 The Torchmate CNC Stampede will be September 7-11, 2011 hosted at the Grand Sierra Resort and Exit 28 Motorsports Park. For more information go to www.Ultra4Racing.com. About Torchmate: Headquartered in Reno, Nev., Torchmate CNC Cutting Systems manufactures custom CNC plasma cutting tables and other automation solutions for manufacturers worldwide. For more than 30 years, Torchmate has provided more options, accessories and innovations than any other CNC cutting table manufacturer in the world. Whether a plasma cutter, router, water jet, engraver, glue gun or any other tool, Torchmate CNC System’s deliver the highest precision and repeatability on the market. For more information, call toll free at (866) 571-1066 or internationally at (775) 673-2200, or visit us on our website, www.torchmate.com. About JT Taylor: JT Taylor is the epitome of “been there, done that”. A retired First Sergeant who returned from the Iraq conflict with a Bronze Star, Taylor uses the skills that he honed as a soldier to manage the Torchmate Racing team. His strategic and mechanical capabilities have served him not just with Torchmate racing, but also in previous Crew Chief positions with Speed Technologies, Shannon Campbell and Dirt Sports race teams. He was the Crew Chief for Speed Technologies 2008 Class 1 Baja 1000 win, 2009 Baja 500 Torchmate team, and co-drove and was crew for the 2009 Baja 1000 and 2010 NORRA 1000, and pits for Speed Technologies SuperLite #16 in the Lucas Oil Off Road Racing Series. It would be foolish to think that Taylor is only handy with a wrench though, he is just as comfortable behind the wheel. Taylor consistently held a top ten position in XORRA for five years and is the two year reigning champion of the XORRA Germany Series. He is the Colorado Hill Climb Association Ultra4 Champion and made history as the first Ultra4 competitor to run Pikes Peak, where he won the Exhibition class. Taylor is one of the original thirteen competitors of King of the Hammers who has raced every year, including 2010 with Roger Norman on his team. About Jesse Haines: Over the past decade Jesse Haines has established himself as one of the top fabricators in the off road industry while simultaneously cementing his legacy as one of the winningest drivers in rockcrawling history. Haines was first introduced to rockcrawling while competing at the legendary Four Wheeler Magazine Top Truck Challenge in 2002 and quickly developed a passion for the sport. Just three short years later, Jesse found himself atop the podium as the WE Rock Unlimited Class National Champion in a vehicle of his own design. To his record, Haines has won an astounding twelve rockcrawling competitions from Pennsylvania to California, a series championship, and had dozens of podium finishes. Between competitions, Haines has also built numerous championship-winning vehicles for both himself and other competitors. Haines has been on the leading edge of the wildly popular Ultra4 Racing explosion with respectable finishes at VORRA desert races, the Ultra 4 Stampede, and the King of the Hammers. Throughout his career Haines has been seen on Trucks TV, Extreme 4×4, Superlift TV, Lucas Oil – On The Edge, MTV’s Megadrive, and Modern Marvels.